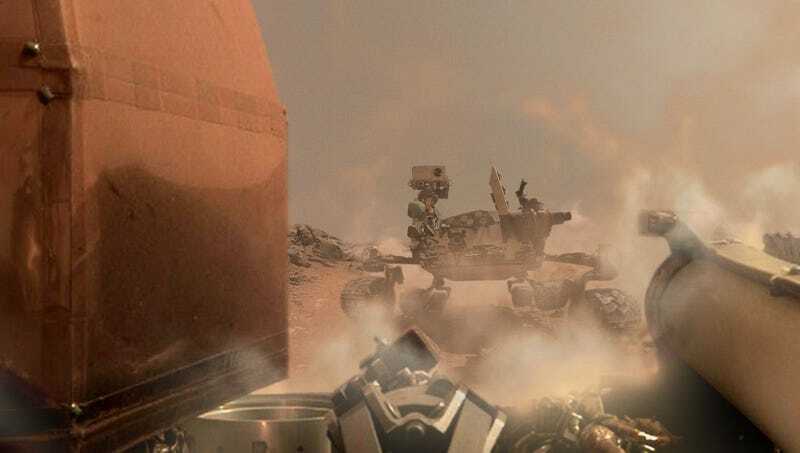 PASADENA, CA—According to panicking officials at NASA’s Jet Propulsion Laboratory, the new InSight lander successfully touched down on the Red Planet Monday, transmitted a few seconds of footage showing the Mars Curiosity rover charging hard in its direction, and then went completely dark. “In a series of blurry images received just before we lost all contact with the lander, we can see Curiosity suddenly appearing in the distance, cresting a dune, and advancing at full speed toward InSight,” said the mission’s principal investigator, W. Bruce Banerdt, explaining that the spacecraft had landed 370 miles north of Curiosity’s last known location, and that his team had no idea how the rover found the landing site or why it apparently rammed into InSight with maximum force. “One minute, we’re congratulating each other on a successful landing, and the next, we see Curiosity barreling down on InSight and kicking up a cloud of red dust in its wake.” Banerdt acknowledged he was less than hopeful about restoring communication with InSight after Curiosity transmitted several photos of what appeared to be the rover hoisting a severed antenna from the lander like a trophy.